WIFI with computer for guests. 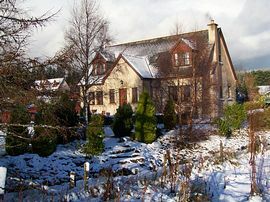 Speyburn House offers luxury bed and breakfast in Speyside. 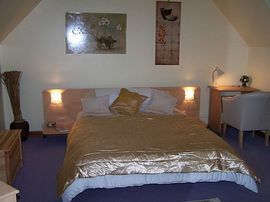 3 luxurious rooms, with King size beds 2 en-suite, 1 private bathroom. Hairdryers, clock radio, hospitality trays with filter coffee, robes, TV-DVD-freeview TV, mini bars, WIFI with computer desk. Ensuite bathrooms, with complimentary toiletries. Separate desk and computer for guests. We offer our guests a welcome drink on arrival, eg local malt. We serve a large varied breakfast. Our situation is ideal for fishing the Spey and visiting the distilleries, we are on the doorstep for Macalland and Cardhu (the home of Johnnie Walker). Walking, golf, hunting etc. The Archiestown Hotel and Bistro is within walking distance. Also nearby Craigellachie and Aberlour have a number of restaurants and whisky bars, serving pub food. 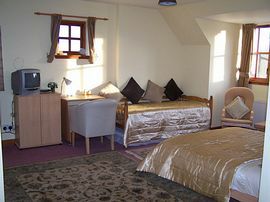 Double occupancy 1 night: £35.00 per person. 2 or more nights: £32.50 per person. "The best B&B by far, and by far I mean from Lands End from whence we have cycled." Herts. 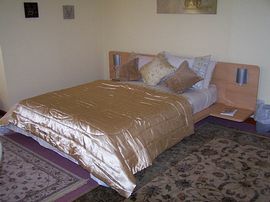 "Well what can I say - exceptional service, with a winning smile, excellent accommodation. The little touches are worth their weight in gold!" W Yorks. 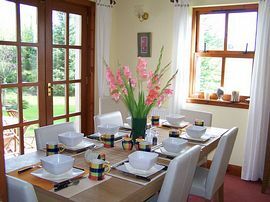 "One of the best B&Bs we've ever stayed in - absolutely excellent." Glasgow. "What a delightful place to wake up - such quiet and such a kind welcome. Splendid garden, splendid breakfast." B9102 scenic route to Grantown on Spey. On main street.